The exterior of your home looks beautiful with its fresh coat of paint or new siding, a carefully designed deck and its rear play area giving your home a well maintained and even a refined look. One area where your home may be struggling is with its garden beds, as nutrient-deprived growing areas may have difficulty bringing forth lush vegetation. You could go out and buy soil and supplements to rejuvenate your gardens or you could choose composting to make use of materials that you already have on hand. Please read on and we will look at how to choose the right materials to make high quality compost without having any compost smell. The very first step that you should take when preparing to compost is to make or buy a bin. This bin will be your dedicated area for assembling the right materials for your compost and should be located outside in an area of your yard where materials can be conveniently added. Choose a location where a water source is available and offers good drainage. Partial shade will reduce the amount of water needed while still helping to “cook” the materials inside. The initial layer of materials in your compost heap should be four to six inches of browns. Specifically, this would be a layer of carbon-rich materials such as leaves, hay, straw and sawdust. Leaves should be shredded, something your lawn mower can handle. On top of your brown material, balance your compost unit with a corresponding amount of greens. These are materials that are high in nitrogen and can include grass cuttings, tea leaves, fruit and vegetable scraps and other kitchen materials. However, do not include meat, dairy and oils, pet feces, weeds that have gone to seed, diseased plants or ash from charcoal. The Minnesota Pollution Control Agency recommends that you water your compost unit as you go. Your pile should be moist, not soaked, like a wrung out sponge. Your pile can get water from rain or you can apply water as needed. Remember, fresh grass clippings are mostly water, therefore less water is needed when your “green” materials are mostly grass. You will carefully layer your compost pile at the onset, but these materials should be mixed at the compost turns. At work are the insects, bacteria and fungi needed to break down the materials and turn this into dirt. As the decomposition process advances, you may seem steam rising from the pile. Summer temperatures can top 150 degrees Fahrenheit and can stay warm even during the winter with regular care on your part. Put on a pair of gloves, place a thermometer deep into the center of the pile and record the temperature advises the Cornell University Waste Management Institute. Quite easily, you can neglect your compost pile and slow down the decomposition process. Water and air are needed to move the process along and with your help you can have compost within months during the summer. Even during the winter your compost pile will need your attention although the break down process will have slowed considerably. After careful observation, you will realize that your compost has been transformed into usable garden material. No, it may not look like dirt, but it will provide the layering that you need to help revive your garden. If your compost pile is not heating up properly it may not be large enough to do the job. Your compost should be at least three feet wide and three feet tall, have adequate moisture and contain ample amounts of nitrogen materials. If you detect a rotten egg smell, your pile likely is too wet. Turn it over, add brown material and add less water for the short term. 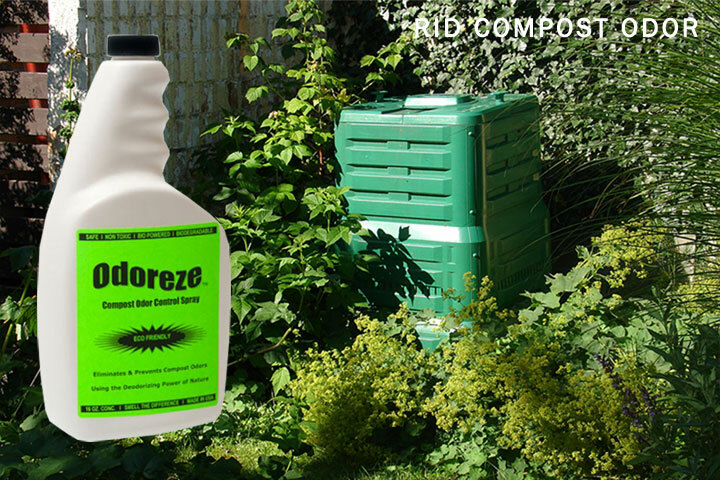 Mix SMELLEZE™ Natural Composting Smell Treatment Granules with the compost. They perform well to control strong decomposition odors. The amount of granules to use depends on the size of the compost bin and can be varied to match the stench. If you prefer a liquid spray instead of granules, consider using ODOREZE™ Plant Based Compost Smell Elimination Spray. This is conveniently available as a super concentrate and one 32 ounce bottle is enough to make over 60 gallons so it doesn’t take up much shelf space and works well. If it is an ammonia smell you detect, add more carbon materials to offset the overabundance of green materials present. If this is not enough, use a professional grade ammonia remover such as AMMOSORB™ Eco Ammonia Absorbent Granules which is effective and eco-friendly. By following the tips above, you should be able to make top quality compost without having to put up smelly compost odor and complaints from your neighbours. When your compost is garden-ready, it won’t solve your garden problems alone. You will still need to add fertilizer containing nitrogen, potassium and phosphorous. Additional ingredients such as zinc, manganese and iron may be needed if your plants do not turn green or remain yellow. Consider organic fertilizer made from manure, emulsion or blood meal as well. Australian Outdoor Living is a home improvement business servicing major cities in Australia. With years of experience, they specialise in outdoor blinds, pergolas, swimming pool installations and folding arm awnings.